Oromo is an Afroasiatic macrolanguage which is primarily composed of four distinct languages: Southern Oromo which includes the Gabra and Sakuye dialects, Eastern Oromo, Orma which includes the Munyo, Orma, Waata/Sanye dialects, and West–Central Oromo. Like Arabic, Oromo is a dialect continuum so language varieties spoken in neighbouring regions differ only slightly, but the differences accumulate over distance so that widely separated varieties are not mutually intelligible. Some of the oldest skeletal evidence for anatomically modern humans has been found in Ethiopia. It is widely considered as the region from which modern humans first set out for the Middle East and places beyond. According to linguists, the first Afroasiatic-speaking populations settled in the Horn region during the ensuing Neolithic era. Tracing its roots to the 2nd millennium BC, Ethiopia's governmental system was a monarchy for most of its history. Oral literature tells that the monarchy was founded by the Solomonic dynasty of the Queen of Sheba, under its first king, Menelik I. 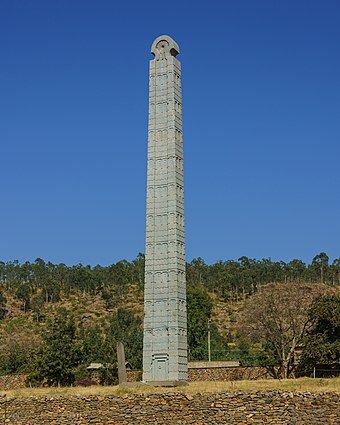 In the first centuries AD, the Kingdom of Aksum maintained a unified civilization in the region,     followed by the Ethiopian Empire circa 1137. During the late 19th-century Scramble for Africa, Ethiopia was one of two nations to retain its sovereignty from long-term colonialism by a European colonial power. Many newly-independent nations on the continent subsequently adopted its flag colors. The country was occupied by Italy in 1936 and became Italian Ethiopia (part of the Italian East Africa) until it was liberated during World War II. Ethiopia was also the first independent member from Africa of the 20th-century League of Nations and the United Nations. In 1974, the Ethiopian monarchy under Haile Selassie was overthrown by the Derg, a communist military government backed by the Soviet Union. In 1987, the Derg established the People's Democratic Republic of Ethiopia, but it was overthrown in 1991 by the Ethiopian People's Revolutionary Democratic Front, which has been the ruling political coalition since. Ethiopia and Eritrea use the ancient Ge'ez script, which is one of the oldest alphabets still in use in the world. The Ethiopian calendar, which is approximately seven years and three months behind the Gregorian calendar, co-exists alongside the Borana calendar. A majority of the population adheres to Christianity (mainly the Ethiopian Orthodox Tewahedo Church and P'ent'ay) and the historical Kingdom of Aksum was one of the first states to officially adopt the religion, whereas around a third follows Islam (primarily Sunni). The country is the site of the Migration to Abyssinia and the oldest Muslim settlement in Africa at Negash. A substantial population of Ethiopian Jews, known as Bete Israel, also resided in Ethiopia until the 1980s. Ethiopia is a multilingual nation with around 80 ethnolinguistic groups, the four largest of which are the Oromo, Amhara, Somali and Tigrayans. Most people in the country speak Afroasiatic languages of the Cushitic or Semitic branches. Additionally, Omotic languages are spoken by ethnic minority groups inhabiting the southern regions. Nilo-Saharan languages are also spoken by the nation's Nilotic ethnic minorities. Oromo is the most populous language by native speakers, while Amharic is the most populous by number of total speakers and serves as the working language in the federal government and as the lingua franca of the country. Ge'ez remains important as a liturgical language, both for the Ethiopian Orthodox Tewahedo Church, Eritrean Orthodox Tewahedo Church, and for the Beta Israel (Ethiopian Jews). Dallol is a locality in the Dallol woreda of northern Ethiopia. Located in Administrative Zone 2 of the Afar Region in the Afar Depression, it has a latitude and longitude of 14°14′19″N40°17′38″E with an elevation of about 130 metres (430 ft) below sea level. The Central Statistical Agency has not published an estimate for this settlement's 2005 population; it has been described as a ghost town. The Ethiopian Highlands is a rugged mass of mountains in Ethiopia, situated in the Horn region in northeast Africa. It forms the largest continuous area of its elevation in the continent, with little of its surface falling below 1,500 m (4,900 ft), while the summits reach heights of up to 4,550 m (14,930 ft). It is sometimes called the Roof of Africa due to its height and large area. 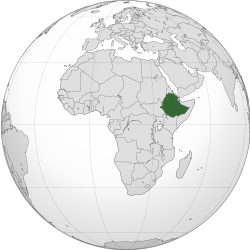 Most of the Ethiopian Highlands are part of central and northern Ethiopia, and its northernmost portion reaches into Eritrea. Sof Omar Cave is the longest cave in Ethiopia at 15.1 kilometres (9.4 mi) long; sources claim it is the longest system of caves in Africa. It is situated to the east of Robe, in the Bale Zone of the Oromia Region in southeastern Ethiopia, through which the Weyib River flows. It sinks at the Ayiew Maco entrance and reappears at the Holuca resurgence 1 kilometre (0.62 mi) away. According to tradition Sof Omar was the name of a Muslim holy man who lived in the area and Ayiew the name of his daughter. Maco and Holuca are local names for 'name' and 'cave', respectively. 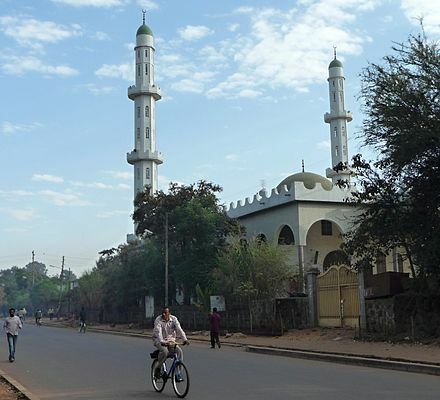 Long a religious centre, it is sacred both to Islam and the local Oromo traditional religion. The caves are known for their many pillars, particularly in the 'Chamber of Columns'. The Greek name Αἰθιοπία (from Αἰθίοψ, Aithiops, 'an Ethiopian') is a compound word, derived from the two Greek words, from αἴθω + ὤψ (aitho "I burn" + ops "face"). According to the Perseus Digital Library, the designation properly translates as Burnt-face in noun form and red-brown in adjectival form. The historian Herodotus used the appellation to denote those parts of Africa below the Sahara that were then known within the Ecumene (inhabitable world). However, the Greek formation may be a folk etymology for the Ancient Egyptian term athtiu-abu, which means 'robbers of hearts'. This Greek name was borrowed into Amharic as ኢትዮጵያ, ʾĪtyōṗṗyā. 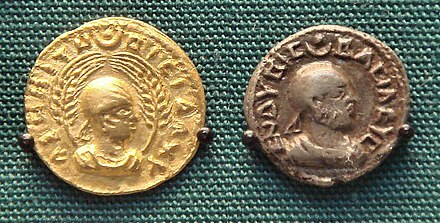 Around 316 AD, Frumentius and his brother Edesius from Tyre accompanied their uncle on a voyage to Ethiopia. When the vessel stopped at a Red Sea port, the natives killed all the travelers except the two brothers, who were taken to the court as slaves. They were given positions of trust by the monarch, and they converted members of the royal court to Christianity. Frumentius became the first bishop of Aksum. A coin dated to 324 shows that Ethiopia was the second country to officially adopt Christianity (after Armenia did so in 301), although the religion may have been at first confined to court circles; it was the first major power to do so. Following the entry of Italy into World War II, British Empire forces, together with the Arbegnoch (lit. "patriots", referring to armed resistance soldiers) restored sovereignty of Ethiopia in the course of the East African Campaign in 1941. An Italian guerrilla campaign continued until 1943. This was followed by British recognition of Ethiopia's full sovereignty, (i.e. without any special British privileges), with the signing of the Anglo-Ethiopian Agreement in December 1944. Under the peace treaty of 1947, Italy recognised the sovereignty and independence of Ethiopia. According to the Democracy Index published by the United Kingdom-based Economist Intelligence Unit in late 2010, Ethiopia is an "authoritarian regime", ranking as the 118th-most democratic out of 167 countries. Ethiopia has dropped 12 places on the list since 2006, and the latest report attributes the drop to the government's crackdown on opposition activities, media and civil society before the 2010 parliamentary election, which the report argues has made Ethiopia a de facto one-party state. In July 2015, during a trip that then US President Barack Obama took to Ethiopia, he highlighted the role of the country in the fight against Islamic terrorism. Obama was the first sitting United States president to visit Ethiopia. The government initiated a crackdown in the provinces as well; in Oromia state the authorities used concerns over insurgency and terrorism to use torture, imprisonment, and other repressive methods to silence critics following the election, particularly people sympathetic to the registered opposition party Oromo National Congress (ONC). The government has been engaged in a conflict with rebels in the Ogaden region since 2007. The biggest opposition party in 2005 was the Coalition for Unity and Democracy (CUD). After various internal divisions, most of the CUD party leaders have established the new Unity for Democracy and Justice party led by Judge Birtukan Mideksa. A member of the country's Oromo ethnic group, Ms. Birtukan Mideksa is the first woman to lead a political party in Ethiopia. At 1,126,829 square kilometres (435,071 sq mi),  Ethiopia is the world's 27th-largest country, comparable in size to Bolivia. It lies between the 3rd parallel north and the 15th parallel north and longitudes 33rd meridian east and 48th meridian east. 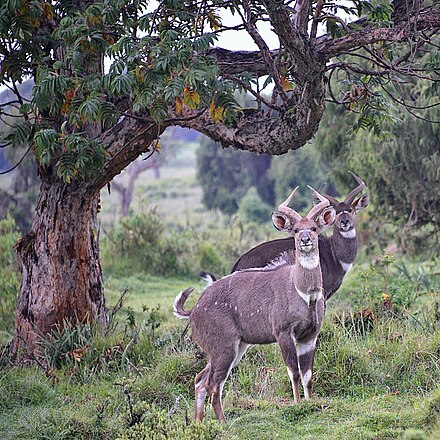 Ethiopia has 31 endemic species of mammals. The African wild dog prehistorically had widespread distribution in the territory. However, with last sightings at Finicha'a, this canid is thought to be potentially locally extinct. The Ethiopian wolf is perhaps the most researched of all the endangered species within Ethiopia. Agriculture constitutes around 85% of the labour force. However, the service sector represents the largest portion of the GDP. Many other economic activities depend on agriculture, including marketing, processing, and export of agricultural products. Production is overwhelmingly by small-scale farmers and enterprises, and a large part of commodity exports are provided by the small agricultural cash-crop sector. Principal crops include coffee, legumes, oilseeds, cereals, potatoes, sugarcane, and vegetables. 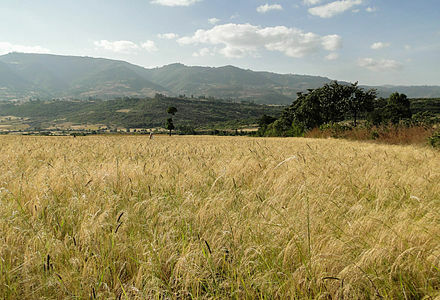 Ethiopia is also a Vavilov center of diversity for domesticated crops, including enset  , coffee and teff. Exports are almost entirely agricultural commodities (with the exception of Gold exports), and coffee is the largest foreign exchange earner. Ethiopia is Africa's second biggest maize producer. 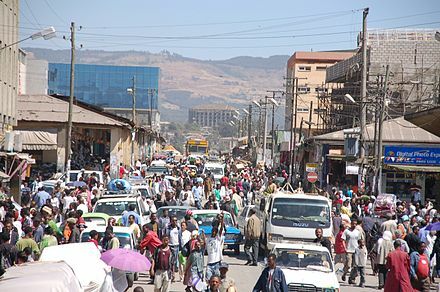 According to UN estimations the per capita GDP of Ethiopia has reached $357 as of 2011 [update] . The same report indicated that the life expectancy had improved substantially in recent years. The life expectancy of men is reported to be 56 years and for women 60 years. 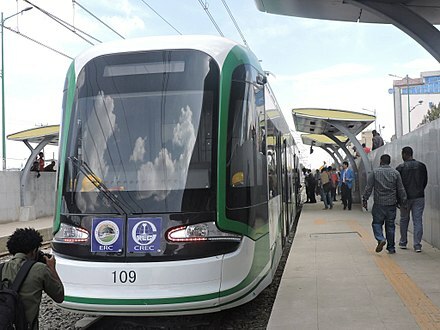 Ethiopia has 926 km of electrified 1,435 mm (4 ft 8 1⁄2 in) standard gauge railways, 656 km for the Addis Ababa–Djibouti Railway between Addis Ababa and the Port of Djibouti (via Awash)  and 270 km for the Awash–Hara Gebeya Railway between Addis Ababa and the twin cities of Dessie/Kombolcha  (also via Awash). Both railways are either in trial service or still under construction as of August 2017 [update] . Once commissioned and fully operational in 2018/2019, both railways will allow passenger transport with a designated speed of 120 km/hour and freight transport with a speed of ~80 km/hour. Expected travel time from Addis Ababa to Djibouti City for passengers would be less than twelve hours and travel time from Addis Ababa to Dessie/Kombolcha would be around six hours. Beyond the first 270 km of the Awash–Hara Gebeya Railway, a second construction phase over 120 km foresees the extension of this railway from Dessie/Kombolcha to Hara Gebeya/Woldiya. It is not clear, when this section will be built and opened. A third, northern 216 km long railway is also under construction between Mek'ele and Woldiya, but it is also not clear, when this railway will be commissioned and opened. All railways are part of a future railway network of more than 5,000 km of railways, the National Railway Network of Ethiopia. Afroasiatic-speaking communities make up the majority of the population. Among these, Semitic speakers often collectively refer to themselves as the Habesha people. The Arabic form of this term (al-Ḥabasha) is the etymological basis of "Abyssinia," the former name of Ethiopia in English and other European languages. Additionally, Nilo-Saharan-speaking ethnic minorities inhabit the southern regions of the country, particularly in areas of the Gambela Region which borders South Sudan. The largest ethnic groups among these include the Nuer and Anuak. English is the most widely spoken foreign language, and is the medium of instruction in secondary schools. Amharic was the language of primary school instruction, but has been replaced in many areas by regional languages such as Oromiffa, Somali or Tigrinya. While all languages enjoy equal state recognition in the 1995 Constitution of Ethiopia, Amharic is recognized as the official working language of the Federal Government. The various regions of Ethiopia and chartered cities are free to determine their own working languages. Amharic is recognised as the official working language of Amhara Region, Benishangul-Gumuz, Southern Nations, Nationalities, and Peoples' Region, Gambela Region, Addis Abeba and Dire Dawa,  while Afar,  Harari,  Oromiffa,  Somali  and Tigrinya  are recognized as official working languages in their respective regions. In terms of writing systems, Ethiopia's principal orthography is the Ge'ez script. Employed as an abugida for several of the country's languages, it first came into usage in the 6th and 5th centuries BC as an abjad to transcribe the Semitic Ge'ez language. 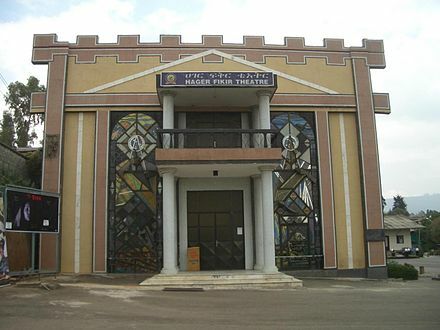 Ge'ez now serves as the liturgical language of the Ethiopian Orthodox Tewahedo Church and Eritrean Orthodox Tewahedo Church. During the 1980s, the Ethiopic character set was computerized. It is today part of the Unicode standard as Ethiopic, Ethiopic Extended, Ethiopic Supplement and Ethiopic Extended-A. The World Health Organization's 2006 World Health Report gives a figure of 1,936 physicians (for 2003),  which comes to about 2.6 per 100,000. Globalization is said to affect the country, with many educated professionals leaving Ethiopia for better economic opportunities in the West. The state of public health is considerably better in the cities. Birth rates, infant mortality rates, and death rates are lower in cities than in rural areas due to better access to education, medicines, and hospitals. 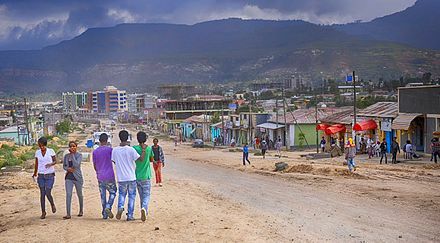 Life expectancy is better in cities compared to rural areas, but there have been significant improvements witnessed throughout the country in recent years, the average Ethiopian living to be 62.2 years old, according to a UNDP report. Despite sanitation being a problem, use of improved water sources is also on the rise; 81% in cities compared to 11% in rural areas. As in other parts of Africa, there has been a steady migration of people towards the cities in hopes of better living conditions. There are 119 hospitals (12 in Addis Ababa alone) and 412 health centers in Ethiopia. Infant mortality rates are relatively high, as 41 infants die per 1,000 live births. Ethiopia has been able to reduce under-five mortality by two-thirds (one of the Millennium Development Goals) since 1990  Although this is a dramatic decrease, birth-related complications such as obstetric fistula affect many of the nation's women. Ethiopia has a relatively high infant and maternal mortality rate. Although, Ethiopia did not meet the MDG target of reducing maternal mortality rate by two thirds in 2015, there are improvements nonetheless. For instance, the contraception prevalence rate increased from 8.1% in 2000 to 41.8% in 2014, and Antenatal care service coverage increase from 29% to an astounding 98.1% in the same period. Currently, the maternal mortality rate stands at 420 per 100,000 live births. Only a minority of Ethiopians are born in hospitals, while most are born in rural households. Those who are expected to give birth at home have elderly women serve as midwives who assist with the delivery (Kater, 2000). The "WHO estimates that a majority of maternal fatalities and disabilities could be prevented if deliveries were to take place at well-equipped health centers, with adequately trained staff" (Dorman et al., 2009, p. 622). 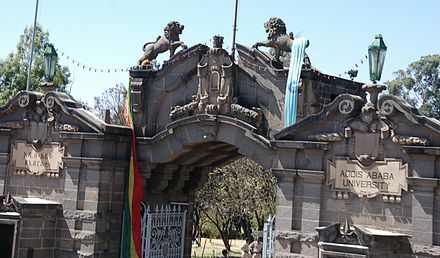 Entrance of Addis Ababa University. The best-known Ethiopian cuisine consists of various types of thick meat stews, known as wat in Ethiopian culture, and vegetable side dishes served atop injera, a large sourdough flatbread made of teff flour. 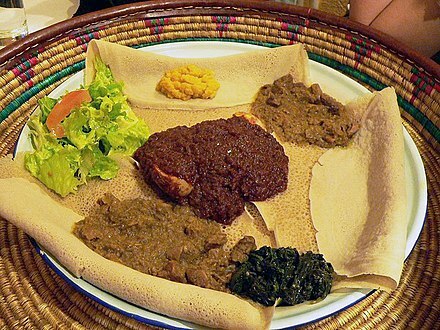 This is not eaten with utensils, but instead one uses the injera to scoop up the entrées and side dishes. Almost universally in Ethiopia, it is common to eat from the same dish in the center of the table with a group of people. It is also a common custom to feed others in your group with your own hands—a tradition referred to as "gursha". Traditional Ethiopian cuisine employs no pork or shellfish of any kind, as they are forbidden in the Christian (Ethiopian Orthodox), Islamic and Jewish faiths. The most widely circulated newspapers in Ethiopia are Addis Fortune, Capital Ethiopia, Ethiopian Reporter, Addis Zemen[ citation needed ] (Amharic) and Ethiopian Herald [ citation needed ]. The music of Ethiopia is extremely diverse, with each of the country's 80 ethnic groups being associated with unique sounds. Ethiopian music uses a distinct modal system that is pentatonic, with characteristically long intervals between some notes. As with many other aspects of Ethiopian culture and tradition, tastes in music and lyrics are strongly linked with those in neighboring Eritrea, Somalia, Djibouti, and Sudan. Traditional singing in Ethiopia presents diverse styles of polyphony (heterophony, drone, imitation, and counterpoint). Traditionally, lyricism in Ethiopian song writing is strongly associated with views of patriotism or national pride, romance, friendship, and a most unique type of memoire known as 'Tizita'. The main sports in Ethiopia are track and field (particularly long distance running) and football. Ethiopian athletes have won many Olympic gold medals in track and field, most of them in long distance running. Haile Gebrselassie is a world-renowned long distance runner with several world records under his belt. Kenenisa Bekele and Tirunesh Dibaba are also dominant runners, particularly in the 5,000 and 10,000 meters in which they hold the world records. Other notable Ethiopian athletes are Abebe Bikila, Mamo Wolde, Miruts Yifter, Derartu Tulu, Meseret Defar, Almaz Ayana, Birhane Adere, Tiki Gelana, Genzebe Dibaba, Tariku Bekele, and Gelete Burka. As of 2012 [update] going into 2013, the current national Ethiopian national football team (nicknamed the Walayia Antelopes) has made itself history by qualifying for the 2012 Africa Cup of Nations and more recently by reaching the last 10 African football teams in the last stage of qualification for the 2014 FIFA World Cup. Noted players include captain Adane Girma and top scorer Saladin Said. "Eritrea" is an ancient name, associated in the past with its Greek form Erythraia, Ἐρυθραία, and its derived Latin form Erythræa. This name relates to that of the Red Sea, then called the Erythræan Sea, from the Greek for "red", ἐρυθρός, erythros. The Italians created the colony of Eritrea in the 19th century around Asmara, and named it with its current name. After World War II Eritrea was annexed to Ethiopia. 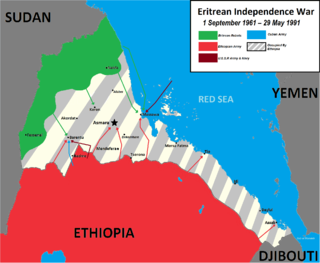 In 1991 the Eritrean People's Liberation Front defeated the Ethiopian "derg" government. Tigray is a region of Ethiopia whose religions, food, language and culture are the same as that of the greater part of Eritrea. A lot of people have families on both sides of the border between Eritrea and Tigray. 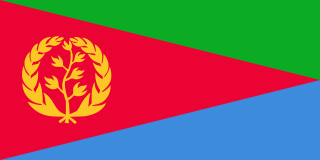 Eritrea officially celebrated its 1st anniversary of independence on May 24, 1991. The government of Ethiopia is structured as a federal parliamentary republic with both a President and Prime Minister. State of Tigray is the northernmost of the nine regions (kililat) of Ethiopia. Tigray is the homeland of the Tigrayan, Irob and Kunama peoples. Tigray is also known as Region 1 according to the federal constitution. Its capital and largest city is Mekelle. 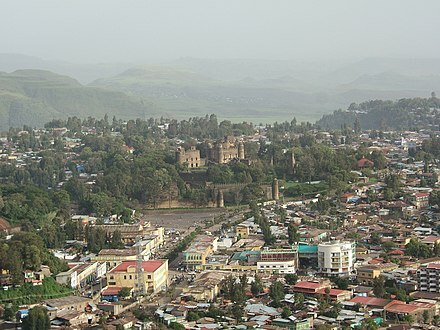 Tigray is the 6th largest by area, the 5th most populous, and the 5th most densely populated of the 9 Regional States. 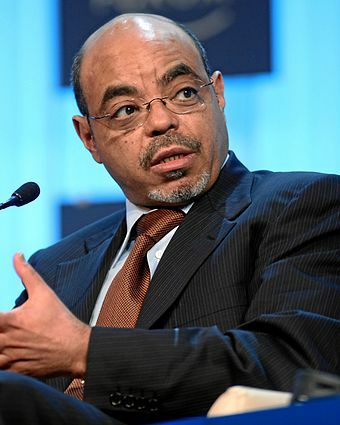 Meles Zenawi Asres was an Ethiopian politician who was the 13th Prime Minister of Ethiopia from 1995 to his death in 2012. From 1989, he was the chairman of the Tigray People's Liberation Front (TPLF), and the head of the Ethiopian People's Revolutionary Democratic Front (EPRDF) since its formation in 1991. Before becoming Prime Minister in 1995, he served as President of the Transitional Government of Ethiopia from 1991 to 1995. Dire Dawa is one of two chartered cities in Ethiopia. 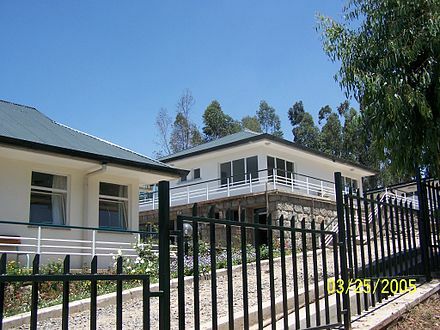 It is divided administratively into two woredas, the city proper and the non-urban woreda of Gurgura. Nekemte is a market town and separate woreda in western Ethiopia. 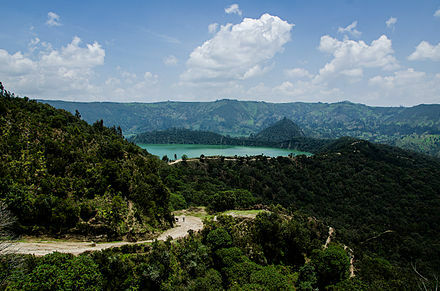 Located in the East Welega Zone of the Oromia Region, Nekemte has a latitude and longitude of 9°5′N36°33′E and an elevation of 2,088 meters. Tesfaye Dinka Yadessa was Minister of Finance (1983–1986), Minister of Foreign Affairs (1989–1991), and Prime Minister of Ethiopia. He was the head of the delegation of the Ethiopian Government during the London Conference of 1991 which aimed to end the Ethiopian Civil War. The Harari people, also called Geyusu, are an ethnic group inhabiting the Horn of Africa. Members traditionally reside in the walled city of Harar, situated in the Harari Region of eastern Ethiopia. They speak Harari, a member of the Ethiosemitic language group within the Afroasiatic family. Semien Province was a historical province of northwest Ethiopia, often called west part of Tigray. Historically it has always been part of the old Tigray state. It was located south and west of the Tekezé River. It was west of Tembien province, south west of Mereb Lehe and to the far east of the Sudan. 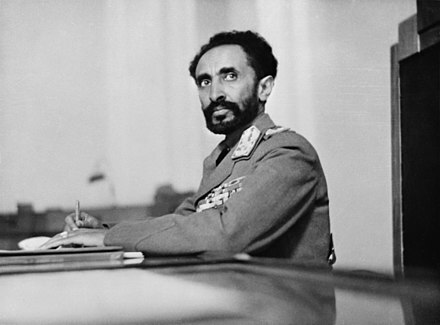 It was included under the former Begemder Province from 1941 to 1995, when Haile Selassie expanded Begemder province. 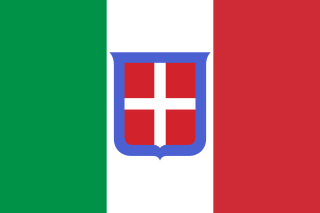 Italian Ethiopia was a colony of the Kingdom of Italy located in East Africa, on the territory of Ethiopia. It was proclaimed in 1936 following the second Italo-Ethiopian War in which the Ethiopian Empire was occupied by Benito Mussolini's Fascist Italy. It became part of Italian East Africa, with its capital moved to Addis Ababa and Victor Emmanuel III proclaiming himself Emperor of Ethiopia. 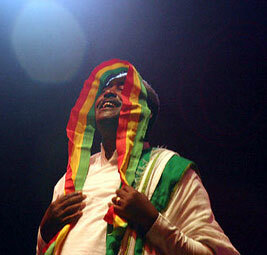 Ethiopian nationalism asserts that Ethiopians are a nation and promotes the cultural unity of Ethiopians. It is especially centered on the culture of the Amhara people. The Bale revolt or the Bale Peasant Movement was a guerrilla war in the southeastern Ethiopian province of Bale led by the local Oromo and Somali population. The revolt targeted the settlement of the Amhara people and feudalistic system in place in the Ethiopian Empire. 1 2 3 "Article 5" (PDF). Ethiopian Constitution. WIPO. Retrieved 2 July 2015. 1 2 Totalitarismo, Mister (2 December 2018). "Italianismi nel somalo e nell'amarico". ↑ "Africa :: Ethiopia — the World Factbook - Central Intelligence Agency". 1 2 3 4 5 6 7 8 9 10 "Country Level". 2007 Population and Housing Census of Ethiopia. CSA. 13 July 2010. Retrieved 18 January 2013. 1 2 3 4 "Report for Selected Countries and Subjects: Ethiopia". World Economic Outlook Database. International Monetary Fund. ↑ Selima, Jāhāna (2015). Work for human development (PDF). Human Development Report. United Nations Development Programme. p. 232. ISBN 978-92-1-126398-5. OCLC 936070939. ↑ Hopkin, Michael (16 February 2005). "Ethiopia is top choice for cradle of Homo sapiens". Nature . doi:10.1038/news050214-10. ↑ Li, J.Z. ; Absher, D.M. ; Tang, H.; Southwick, A.M.; Casto, A.M.; Ramachandran, S.; Cann, H.M.; Barsh, G.S. ; Feldman, M.; Cavalli-Sforza, L.L. ; Myers, R.M. (2008). "Worldwide Human Relationships Inferred from Genome-Wide Patterns of Variation". Science . 319 (5866): 1100–04. Bibcode:2008Sci...319.1100L. doi:10.1126/science.1153717. PMID 18292342. ↑ "Humans Moved From Africa Across Globe, DNA Study Says". Bloomberg News. 21 February 2008. Archived from the original on 29 June 2011. Retrieved 16 March 2009. ↑ Kaplan, Karen (21 February 2008). "Around the world from Addis Ababa". Los Angeles Times. Star Tribune. Archived from the original on 3 June 2013. Retrieved 16 March 2009. 1 2 Zarins, Juris (1990). "Early Pastoral Nomadism and the Settlement of Lower Mesopotamia". Bulletin of the American Schools of Oriental Research. 280 (280): 31–65. doi:10.2307/1357309. JSTOR 1357309. ↑ "In search of the real Queen of Sheba". 2018-12-03. ↑ "The Reporter – English Edition" Archived 29 October 2013 at the Wayback Machine . thereporterethiopia.com. ↑ Page, Willie F. (2001). Encyclopedia of African history and culture: African kingdoms (500 to 1500), Volume 2. Facts on File. p. 230. ISBN 978-0-8160-4472-6. ↑ Weil, Shalva (2008) "Jews in Ethiopia", pp. 467–75 in Encyclopaedia of the Jewish Diaspora, Vol. 2. M.A. Erlich (ed.). Santa Barbara, USA: ABC CLIO. ↑ Weil, Shalva (2011) "Ethiopian Jews", pp. 165–66 in Cambridge Dictionary of Judaism and Jewish Culture. Judith Baskin (ed.). New York: Cambridge University Press. 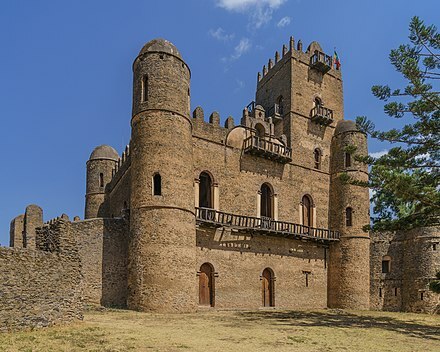 ↑ "Ethiopia: Most World Heritage Sites in Africa". Deep from an Ethiopian – An Ethiopian blog. ↑ "Ethiopia surpasses Kenya to become East Africa's Biggest Economy". Nazret.com. 6 February 2010. Retrieved 2 June 2010. ↑ Ethiopia GDP purchasing power 2010: 86 billion. International Monetary Fund (14 September 2006). Retrieved on 3 March 2012. ↑ Kenya GDP purchasing power 2010: 66 Billion. International Monetary Fund (14 September 2006). Retrieved on 3 March 2012. ↑ Liddell, Henry George; Scott, Robert. "Aithiops". A Greek-English Lexicon. Perseus. Retrieved 16 March 2009. ↑ Partridge, Eric. Origins: A Short Etymological Dictionary of the English Language, 4th ed. 1966, p. 188. 1 2 Hatke, George (2013). Aksum and Nubia: Warfare, Commerce, and Political Fictions in Ancient Northeast Africa. NYU Press. pp. 52–53. ISBN 978-0-8147-6066-6. 1 2 Africa Geoscience Review, Volume 10. Rock View International. 2003. p. 366. Retrieved 9 August 2014. ↑ Schoff, Wilfred Harvey (1912). The Periplus of the Erythraean Sea: travel and trade in the Indian Ocean. Longmans, Green, and Co. p. 62. Retrieved 28 September 2016. ↑ Ansari, Azadeh (October 7, 2009). "Oldest human skeleton offers new clues to evolution". CNN.com/technology. Retrieved 2 March 2011. ↑ "Mother of man – 3.2 million years ago". Bbc.co.uk. Retrieved 2009-03-16. ↑ Johanson, Donald C.; Wong, Kate (2010). Lucy's Legacy: The Quest for Human Origins. Crown Publishing Group. pp. 8–9. ISBN 978-0-307-39640-2. ↑ "Institute of Human Origins: Lucy's Story". 2016-06-15. Retrieved March 23, 2017. ↑ Mcdougall, I.; Brown, H.; Fleagle, G. (Feb 2005). 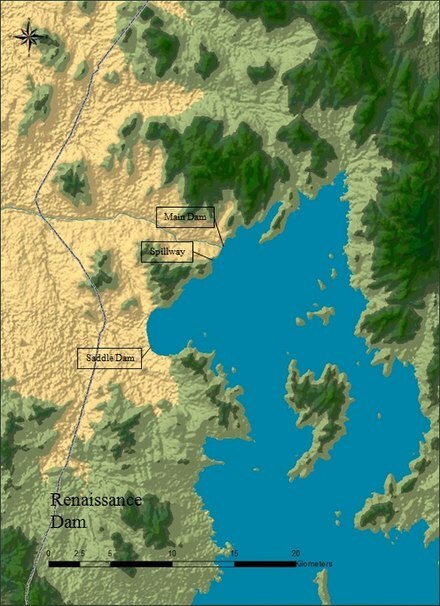 "Stratigraphic placement and age of modern humans from Kibish, Ethiopia". Nature. 433 (7027): 733–36. Bibcode:2005Natur.433..733M. doi:10.1038/nature03258. PMID 15716951. ↑ White, T.D. ; Asfaw, B.; Degusta, D.; Gilbert, H.; Richards, G.D.; Suwa, G.; Clark Howell, F. (2003). "Pleistocene Homo sapiens from Middle Awash, Ethiopia". Nature. 423 (6941): 742–47. Bibcode:2003Natur.423..742W. doi:10.1038/nature01669. PMID 12802332. ↑ Callaway, Ewan (7 June 2017). "Oldest Homo sapiens fossil claim rewrites our species' history". Nature . doi:10.1038/nature.2017.22114 . Retrieved 5 July 2017. ↑ Diamond, J.; Bellwood, P. (2003). "Farmers and Their Languages: The First Expansions" (PDF). Science (Submitted manuscript). 300 (5619): 597–603. Bibcode:2003Sci...300..597D. CiteSeerX 10.1.1.1013.4523 . doi:10.1126/science.1078208. JSTOR 3834351. PMID 12714734. ↑ Blench, R. (2006). Archaeology, Language, and the African Past. Rowman Altamira. pp. 143–44. ISBN 978-0-7591-0466-2. ↑ Tamrat, Taddesse (1972) Church and State in Ethiopia: 1270–1527. London: Oxford University Press, pp. 5–13. ↑ Uhlig, Siegbert (ed.) (2005) Encyclopaedia Aethiopica , "Ge'ez". Wiesbaden: Harrassowitz Verlag, p. 732. ↑ Phillipson, David W. (1998). 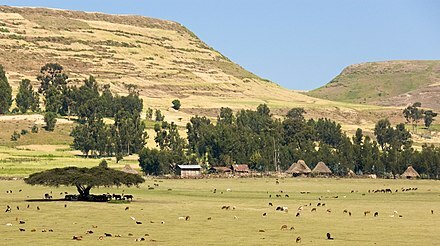 Ancient Ethiopia. Aksum: Its Antecedents and Successors. The British Museum Press. pp. 7, 48–50. ISBN 978-0-7141-2763-7. 1 2 Adejumobi, Saheed A. (2007). The history of Ethiopia. Westport, CN: Greenwood Press. p. 171. ISBN 978-0-313-32273-0. ↑ Hable Sellassie, Sergew (1972). Ancient and Medieval Ethiopian History to 1270. Addis Ababa: United Printers, p. 185. ↑ Tamrat, Taddesse (1972) Church and State in Ethiopia (1270–1527). Oxford: Clarendon Press, p. 34. ↑ Al-Mubarakpuri, Safiur-Rahman (2002). الرحيق المختوم: بحث في السيرة النبوية على صاحبها افضل الصلاة و السلام. ideas4islam. p. 221. ↑ A.K. Irvine, "Review: The Different Collections of Nägś Hymns in Ethiopic Literature and Their Contributions." Bulletin of the School of Oriental and African Studies, University of London. School of Oriental and African Studies, 1985. ↑ van Donzel, Emeri (2005) "Fasilädäs" in Siegbert von Uhlig, ed., Encyclopaedia Aethiopica: D-Ha. Wiesbaden:Harrassowitz Verlag. p. 500. ↑ Trimingham, J. Spencer (1952) Islam in Ethiopia. Oxford: Geoffrey Cumberlege for the University Press. p. 262. ↑ "Political Program of the Oromo People's Congress (OPC)". Gargaaraoromopc.org. 23 April 1996. Archived from the original on 7 March 2009. Retrieved 16 March 2009. ↑ Tibebu, Teshale (June 2018). "Ethiopia in the Nineteenth Century". Oxford Research Encyclopedia of African History. doi:10.1093/acrefore/9780190277734.001.0001 (inactive 2019-03-14). ↑ The Egyptians in Abyssinia Archived 26 December 2011 at the Wayback Machine . Vislardica.com. Retrieved on 3 March 2012. ↑ Lipschutz, Mark (1986). Dictionary of African historical biography. Rasmussen, R. Kent (2nd ed., expanded and updated ed.). Berkeley: University of California Press. p. 1. ISBN 978-0-520-06611-3. OCLC 14069361. ↑ Young, J. (1998). "Regionalism and democracy in Ethiopia". Third World Quarterly. 19 (2): 191–204. doi:10.1080/01436599814415. JSTOR 3993156. 1 2 International Crisis Group, "Ethnic Federalism and its Discontents". Issue 153 of ICG Africa report (4 September 2009) p. 2; Italy lost over 4.600 nationals in this battle. ↑ Keefer, Edward C. (1973). 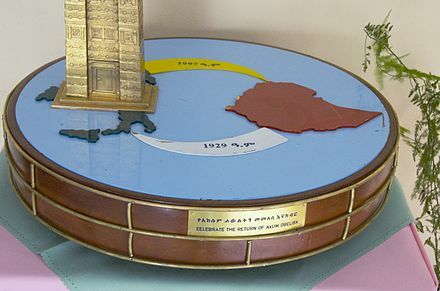 "Great Britain and Ethiopia 1897–1910: Competition for Empire". International Journal of African Studies. 6 (3): 468–74. doi:10.2307/216612. JSTOR 216612. ↑ Martial (de Salviac, père. ), Ayalew Kanno (2005). An Ancient People in the State of Menelik: The Oromo (said to be of Gallic Origin) Great African Nation. Ayalew Kanno. p. 8. ISBN 978-1-59975-189-4. ↑ Greenfield, Richard (1965). Ethiopia: A New Political History. Praeger. , p. 97. ↑ Pankhurst, R. (1966). "The Great Ethiopian Famine of 1888–1892: A New Assessment". Journal of the History of Medicine and Allied Sciences (2): 95–124. doi:10.1093/jhmas/XXI.2.95. ↑ Broich, Tobias (2017). "U.S. and Soviet Foreign Aid during the Cold War – A Case Study of Ethiopia". The United Nations University – Maastricht Economic and Social Research Institute on Innovation and Technology (UNU-MERIT). ↑ Clapham, Christopher (2005) "Ḫaylä Śəllase" in Siegbert von Uhlig, ed., Encyclopaedia Aethiopica: D-Ha. Wiesbaden:Harrassowitz Verlag. pp. 1062–63. ↑ "Man of the Year". TIME. 6 January 1936. Retrieved 16 March 2009. ↑ Leggere la storia, Dai Nazionalismi alla Seconda Guerra Mondiale. Editore: Einaudi Scuola; Autori: Manzoni Occhipinti Cereda Innocenti; pp. 302–03 La politica coloniale : La proclamazione dell'impero. ↑ David, Forgacs (September 2016). "Italian Massacres in Occupied Ethiopia". Revue Africaine des Livres – Centre de Recherche en Antropologie Sociale et Culturelle. Archived from the original on 2017-12-02. ↑ Hinks, Peter P.; McKivigan, John R. and Williams, R. Owen (2007). Encyclopedia of Antislavery and Abolition , Greenwood Publishing Group, p. 248. ISBN 0-313-33143-X. ↑ Campbell, Miers & Miller 2007, p. 219. ↑ Valdes Vivo, p. 115. ↑ Valdes Vivo, p. 21. ↑ Valdes Vivo, p. 25. ↑ Eur (2002). Africa South of the Sahara 2003. Psychology Press. p. 383. ISBN 978-1-85743-131-5. ↑ Dagne, Haile Gabriel (2006). The commitment of the German Democratic Republic in Ethiopia: a study based on Ethiopian sources. London: Global Lit. ISBN 978-3-8258-9535-8. ↑ "The Mengistu Regime and Its Impact". Library of Congress. ↑ Oberdorfer, Don (March 1978). "The Superpowers and the Ogaden War". The Washington Post. ↑ "US admits helping Mengistu escape". BBC. 22 December 1999. Retrieved 2017-12-13. ↑ Ottaway, David B. (1979-03-21). "Addis Ababa Emerges From a Long, Bloody War". The Washington Post. Retrieved 2017-12-13. ↑ Katz, Donald R. (21 September 1978). "Ethiopia After the Revolution: Vultures in the Land of Sheba". Rolling Stone. Retrieved 2017-12-13. ↑ Stapleton, Timothy J. (2017). A History of Genocide in Africa. ABC-CLIO. p. 163. ISBN 978-1-4408-3052-5. ↑ "Foreign Policy". Library of Congress – American Memory: Remaining Collections. ↑ Crowell Anderson-Jaquest, Tommie (May 2002). "Restructuring the Soviet–Ethiopian Relationship: A Csse Study in Asymmetric Exchange" (PDF). London School of Economics and Political Science. ↑ Tessema, Seleshi (November 2017). "ADDIS ABABA". Anadolu Agency. ↑ "Why a photo of Mengistu has proved so controversial". BBC News. August 2018. ↑ "Mengistu found guilty of genocide". BBC. 12 December 2006. Retrieved 21 July 2007. Ethiopia's Marxist ex-ruler, Mengistu Haile Mariam, has been found guilty of genocide after a 12-year trial. 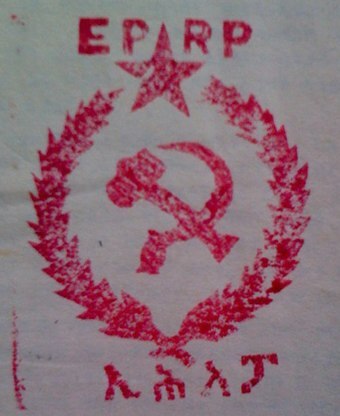 ↑ "Bureau of Democracy, Human Rights, and Labor 2005". U.S. Department of State. March 2006. ↑ "Mengistu Haile Mariam". Trial International. June 2006. ↑ "Eshetu Alemu". Trial International. January 2018. ↑ Alemu Aneme, Girmachew (2001). "Apology and trials: The case of the Red Terror trials in Ethiopia". African Human Rights Law Journal. ↑ Lyons 1996, pp. 121–23. ↑ "Ethiopia (03/08)". U.S. Department of the State. ↑ "About Ethiopia". Ethiopian Government Portal. ↑ Lyons 1996, p. 142. ↑ "President expelled from ruling party". IRIN. 2001-06-25. Retrieved 2017-11-07. ↑ "Will arms ban slow war?". BBC News. 18 May 2000. Archived from the original on 12 January 2017. Retrieved 12 January 2017. ↑ "War 'devastated' Ethiopian economy". BBC News. 7 August 2001. Archived from the original on 4 July 2016. Retrieved 12 January 2017. ↑ Voice of America (2010-05-16). "2005 Ethiopian election: a look back" . Retrieved 2018-05-06. ↑ "Document". www.amnesty.org. Retrieved 2017-11-07. ↑ Press, Associated (2010-05-25). "Ethiopia election marred by intimidation, say rights group". The Guardian. Retrieved 2017-11-07. ↑ "The worst drought in 60 years in Horn Africa". Africa and Europe in Partnership. Archived from the original on 2 November 2011. Retrieved 2 August 2011. ↑ "Ethiopian Prime Minister Meles has died: state television". Reuters. 21 August 2012. ↑ Lough, Richard (22 August 2012). "Ethiopia acting PM to remain at helm until 2015". Reuters. ↑ Malone, Barry (27 May 2015). "Profile: Ethiopia's 'placeholder' PM quietly holds on". aljazeera.com. Al Jazeera English . Retrieved 28 July 2015. ↑ "'Several killed' as Ethiopia police clash with protesters". BBC. 7 August 2016. Retrieved 8 August 2016. ↑ "Internet shutdown ends as protests continue in Ethiopia". BBC Monitoring. 8 August 2016. Retrieved 8 August 2016. ↑ Maasho, Aaron (8 August 2016). "At least 33 protesters killed in Ethiopia's Oromiya region: opposition". Reuters. Retrieved 8 August 2016. ↑ AfricaNews. "Ethiopia declares 6 months state of emergency over Oromia protests | Africanews". Africanews. Retrieved 2017-11-07. ↑ AfricaNews (2017-10-26). "10 killed as Ethiopia forces clash with protesters in Oromia". Africanews. Retrieved 2017-11-07. ↑ "Ethnic violence displaces hundreds of thousands of Ethiopians". irinnews.com. 8 November 2017. ↑ "Violence in southern Ethiopia forces more than 800,000 to flee". Reuters. 4 July 2018. ↑ "At least 23 die in weekend of Ethiopia ethnic violence". 17 September 2018. ↑ "Ethiopia declares state of emergency". BBC News. 16 February 2018 – via www.bbc.com. ↑ "Ethiopians protesting state of emergency shut down capital, Oromia region". France 24. 6 March 2018. ↑ "Ethiopia and Eritrea declare end of war". BBC News. 9 July 2018. ↑ Kaps, Alisa. "From agrarian country to industrial hub". D+C, Development and cooperation. ↑ MENAFN. "Ethiopia grants pardon to 530 prisoners before Christmas celebrations". menafn.com. Retrieved 2019-01-14. ↑ "OONI – Ethiopia: Verifying the unblocking of websites". ooni.torproject.org. Retrieved 2019-01-14. ↑ "Ethiopia prison administration fires 103 individuals – New Business Ethiopia" . Retrieved 2019-01-14. ↑ "Reflections on the Rule of Law and Ethiopia's Transition to Democratic Rule (Part I)". Cyber Ethiopia. 2019-01-12. Retrieved 2019-01-14. ↑ "Ethiopia | Country report | Freedom in the World | 2015". freedomhouse.org. 21 January 2015. Archived from the original on 8 January 2017. Retrieved 8 January 2017. ↑ The Economist Intelligence Unit's Index of Democracy 2010. (PDF). Retrieved on 3 March 2012. ↑ Onyulo, Tonny (26 July 2015). 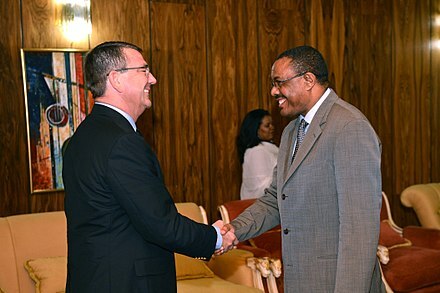 "Obama visit highlights Ethiopia's role in fighting Islamist terrorists". USA Today. 1 2 3 "Map of Freedom 2007". Freedom House. 2007. Retrieved 25 December 2007. 1 2 "Essential Background: Overview of human rights issues in Ethiopia". Human Rights Watch. Archived from the original on 24 December 2007. Retrieved 25 December 2007. ↑ "Ethiopian probe team criticises judge over report". Reuters. 11 September 2006. Archived from the original on 7 September 2012. Retrieved 21 July 2007. ↑ "Ethiopia election: No seat in parliament for opposition". aljazeera.com. 23 June 2015. Retrieved 24 June 2015. ↑ "Obama in Ethiopia for key talks with regional leaders". BBC News. 27 July 2015. Retrieved 27 July 2015. ↑ "Ethiopia Grapples With The Aftermath Of A Deadly Weekend" . Retrieved 2 May 2017. ↑ "UN calls for probe into Ethiopia protesters killings". www.aljazeera.com. Retrieved 2 May 2017. ↑ "Ethiopia says UN observers not needed as protests rage". www.aljazeera.com. Retrieved 2 May 2017. 1 2 "Ethiopia's battle for land reforms could lead to civil war: opposition leader". Reuters. 11 August 2016. Retrieved 8 May 2017– via Reuters. ↑ "Youth in Crisis: Coming of age in the 21st century". Office for the Coordination of Humanitarian Affairs. 23 February 2007. Archived from the original on 5 December 2010. Retrieved 14 June 2012. ↑ "UNICEF supports fight to end marriage by abduction in Ethiopia". reliefweb.int. 9 November 2004. Retrieved 29 August 2013. ↑ Petros, Gezahegn (2000). 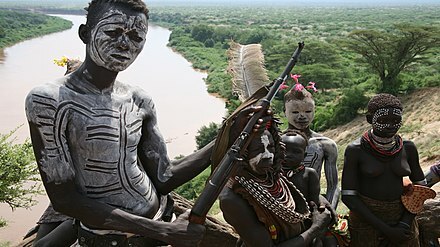 The Karo of the lower Omo Valley: subsistence, social organisation and relations with neighbouring groups. Dept. of Sociology, Anthropology and Social Administration, Addis Ababa University. p. 57. ↑ "Lale Labuko". nationalgeographic.com. Retrieved 5 December 2013. 1 2 "Unheard Voices: The Human Rights Impact of Land Investments on Indigenous Communities in Gambella" (PDF). The Oakland Institute. 2013. ↑ "Country: Ethiopia". The Oakland Institute. Retrieved March 14, 2017. ↑ Mittal, Anuradha (2013-02-25). "Indian land grabs in Ethiopia show dark side of south-south co-operation". The Guardian. Archived from the original on March 14, 2017. Retrieved 2017-03-14. 1 2 Smith, David (April 14, 2015). "Ethiopians talk of violent intimidation as their land is earmarked for foreign investors". The Guardian. Archived from the original on April 14, 2015. Retrieved March 14, 2017. ↑ Horne, Felix (2012-01-16). ""Waiting Here for Death"". Human Rights Watch. Archived from the original on March 14, 2017. Retrieved March 14, 2017. 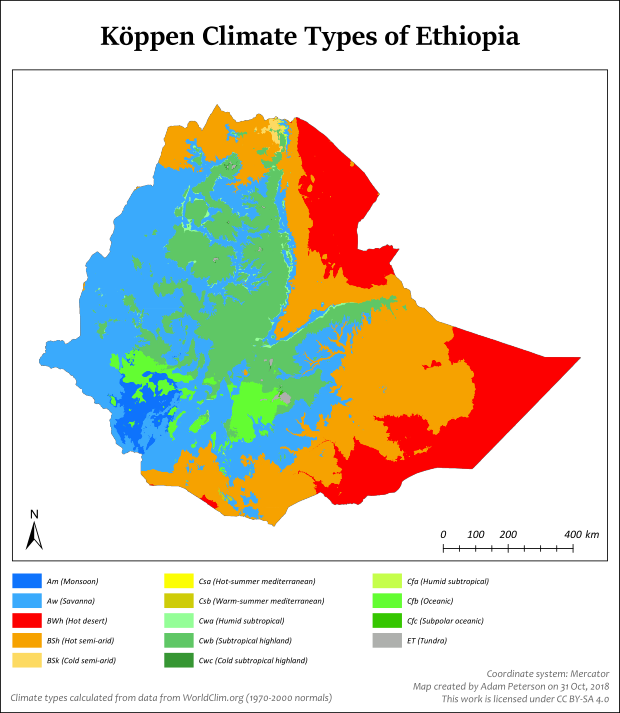 1 2 "Federal Demographic Republic of Ethiopia Central Statistical Agency – Population Projection of Ethiopia for All Regions At Wereda Level from 2014 – 2017". 2014 Population and Housing Census of Ethiopia. CSA. 2014. Archived from the original on 17 October 2015. Retrieved 1 October 2014. ↑ "CIA World Factbook – Rank Order – Area" . Retrieved 2 February 2008. 1 2 Massicot, Paul (2005). Animal Info-Ethiopia. ↑ Lepage, Denis. "Bird Checklists of the World". Avibase. Retrieved 6 October 2013. ↑ Bakerova, Katarina et al. (1991) Wildlife Parks Animals Africa. Retrieved 24 May 2008, from the African Cultural Center Archived 5 February 2011 at the Wayback Machine . ↑ Encyclopedia of Nations. Ethiopia Environment. ↑ Khoury, Colin K.; Achicanoy, Harold A.; Bjorkman, Anne D.; Navarro-Racines, Carlos; Guarino, Luigi; Flores-Palacios, Ximena; Engels, Johannes M.M. ; Wiersema, John H.; Dempewolf, Hannes (2016-06-15). "Origins of food crops connect countries worldwide". Proc. R. Soc. B. 283 (1832): 20160792. doi:10.1098/rspb.2016.0792. PMC 4920324 . ↑ Chaitanya Iyyer (2009). Land Management: Challenges & Strategies. Global India Publications. p. 16. ISBN 978-93-80228-48-8. ↑ Parry, J (2003). Tree choppers become tree planters. Appropriate Technology, 30(4), 38–39. Retrieved 22 November 2006, from ABI/INFORM Global database. (Document ID: 538367341). ↑ "World Economic Outlook" (PDF). IMF. Retrieved 13 January 2013. ↑ "Ethiopia: IMF Positive on Country's Growth Outlook". allAfrica. Retrieved 13 January 2013. ↑ "With Continued Rapid Growth, Ethiopia is Poised to Become a Middle Income Country by 2025" . Retrieved 2016-06-24. ↑ "Economic Overview". World Bank. 23 September 2015. Retrieved 1 February 2016. ↑ "Statement by an IMF Staff Mission on the 2012 Article IV Consultation with Ethiopia". IMF. 14 June 2012. Retrieved 13 January 2013. ↑ "Ethiopia to launch four more industry parks within two years". Reuters. 2015-11-09. Retrieved 2016-06-24. ↑ "Business Corruption in Ethiopia". Business Anti-Corruption Portal. Archived from the original on 6 April 2014. Retrieved 8 April 2014. ↑ "Six million children threatened by Ethiopia drought: UN". Terradaily.com. Retrieved 16 March 2009. ↑ CNN, By Victoria Eastwood and Nima Elbagir. "Ethiopia powers on with controversial dam project" . Retrieved 2016-06-24. ↑ "Power generation begins at 1,870-MW Gibe III hydroelectric project in Ethiopia". www.hydroworld.com. Retrieved 2016-06-24. ↑ Wilkin, Paul; Demissew, Sebsebe; Willis, Kathy; Woldeyes, Feleke; Davis, Aaron P.; Molla, Ermias L.; Janssens, Steven; Kallow, Simon; Berhanu, Admas (2019). "Enset in Ethiopia: a poorly characterized but resilient starch staple". Annals of Botany. doi:10.1093/aob/mcy214. PMID 30715125. ↑ "Get the gangsters out of the food chain". The Economist. 7 June 2007. Retrieved 2 February 2008. ↑ "National Accounts Estimates of Main Aggregates". The United Nations Statistics Division. Retrieved 12 November 2013. 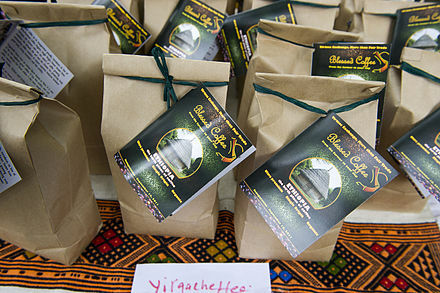 ↑ "Starbucks in Ethiopia coffee vow". BBC. 21 June 2007. Retrieved 21 June 2007. ↑ Cook, Rob (2 September 2015). "World Cattle Inventory: Ranking of countries (FAO) | Cattle Network". www.cattlenetwork.com. Farm Journal. Archived from the original on 8 January 2017. Retrieved 8 January 2017. ↑ "Ethiopia's flower trade in full bloom". Mail & Guardian . 19 February 2006. Archived from the original on 18 April 2007. Retrieved 21 June 2007. Floriculture has become a flourishing business in Ethiopia in the past five years, with the industry's exports earnings set to grow to $100-million by 2007, a five-fold increase on the $20-million earned in 2005. Ethiopian flower exports could generate an estimated $300-million within two to three years, according to the head of the government export-promotion department, Melaku Legesse. ↑ Averill, Victoria (31 May 2007). "Ethiopia's designs on leather trade". BBC. Retrieved 21 June 2007. The label inside the luxuriously soft black leather handbag reads Taytu: Made In Ethiopia. But the embroidered print on the outside, the chunky bronze rings attached to the fashionably short straps and the oversized "it" bag status all scream designer chic. ↑ "Largest hydro electric power plant goes smoothly". English.people.com.cn. 12 April 2006. Retrieved 2 June 2010. ↑ "Hydroelectric Power Plant built". Addistribune.com. Archived from the original on 3 January 2010. Retrieved 16 March 2009. ↑ Independent Online (18 April 2006). "Ethiopia hopes to power neighbors with dams". Int.iol.co.za. Archived from the original on 12 June 2006. Retrieved 16 March 2009. ↑ "Sub-Saharan Africa news in brief: 13–25 March". SciDev.Net. 28 March 2008. Retrieved 16 March 2009. ↑ "Ethiopia–Djibouti electric railway line opens". railwaygazette.com. 2016-10-05. Retrieved 2016-10-05. ↑ "Project Summary". AKH Project owners. January 2017. 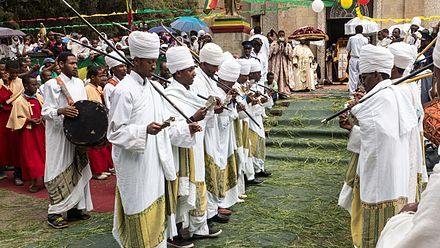 ↑ "Ceremony in Ethiopia". Yapı Merkezi. 25 February 2015. Archived from the original on 7 October 2016. Retrieved 7 October 2016. ↑ "Foundation stone laid for northern Ethiopia line". railwaygazette.com. 2015-02-25. Retrieved 2016-10-05. ↑ "Ethiopia's Road Sector Dev't Becoming Proportionate to Rapid Economic Growth: WB". www.ena.gov.et. Archived from the original on 24 December 2015. Retrieved 2015-12-23. ↑ "List of all airports in Ethiopia". airport-authority.com. Retrieved 2016-03-25. ↑ "Ethiopian Airlines: Company Profile". Ethiopian Airlines. Archived from the original on 13 October 2012. Retrieved 13 October 2012. ↑ "Profile: Ethiopian Airlines". BBC News. 25 January 2010. Archived from the original on 26 April 2012. Retrieved 26 April 2012. ↑ "Ethiopian Airlines – Bringing the Dreamliner to Africa". CNN. 3 September 2012. Archived from the original on 21 September 2012. Retrieved 21 September 2012. ↑ "IFs Forecast – Version 7.00 – Google Public Data Explorer" . Retrieved 24 October 2015. ↑ Istat (December 2010). 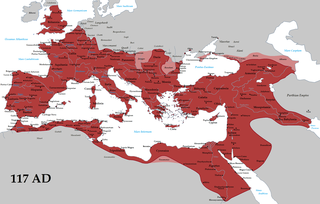 "I censimenti nell'Italia unita I censimenti nell'Italia unita Le fonti di stato della popolazione tra il XIX e il XXI secolo ISTITUTO NAZIONALE DI STATISTICA SOCIETÀ ITALIANA DI DEMOGRAFIA STORICA Le fonti di stato della popolazione tra il XIX e il XXI secolo" (PDF). Annali di Statistica. XII. 2: 263. Archived from the original (PDF) on 3 August 2014. Retrieved 24 December 2013. ↑ "World Refugee Survey 2008". U.S. Committee for Refugees and Immigrants. 19 June 2008. Archived from the original on 2 May 2012. 1 2 "Languages of Ethiopia". Ethnologue. SIL International. Archived from the original on March 18, 2017. Retrieved 9 February 2013. ↑ Yigezu, Moges (2012). Language Ideologies and Challenges of Multilingual Education in Ethiopia. African Books Collective. p. 143. ISBN 978-99944-55-47-8. 1 2 Mpoche, Kizitus; Mbuh, Tennu, eds. (2006). Language, literature, and identity. Cuvillier. pp. 163–64. ISBN 978-3-86537-839-2. ↑ Gebremichael, M. (2011). Federalism and conflict management in Ethiopia: case study of Benishangul-Gumuz Regional State. PhD Thesis. United Kingdom: University of Bradford. ↑ "Afar Regional State". Government of Ethiopia. Retrieved 2017-07-27. ↑ "Harari Regional State". Government of Ethiopia. Retrieved 2017-07-27. ↑ "Oromia Regional State". Government of Ethiopia. Retrieved 2017-07-27. ↑ "Somali Regional State". Government of Ethiopia. Retrieved 2017-07-27. ↑ "Tigray Regional State". Government of Ethiopia. Retrieved 2017-07-27. ↑ Hayward, R.J.; Hassan, M. (2009). "The Oromo orthography of Shaykh Bakri Saṗalō". Bulletin of the School of Oriental and African Studies. 44 (3): 550. doi:10.1017/S0041977X00144209. JSTOR 616613. ↑ Davis, SJ, Leo Donald (1990). The First Seven Ecumenical Councils (325–787): Their History and Theology (Theology and Life Series 21). Collegeville, MN: Michael Glazier/Liturgical Press. p. 342. ISBN 978-0-8146-5616-7. 1 2 3 4 Thomas P. Ofcansky, LaVerle Berry (2004). Ethiopia: A Country Study. Kessinger Publishing. pp. 130–41. ISBN 978-1-4191-1857-9. 1 2 Abegaz, Berhanu (June 1, 2005). "Ethiopia: A Model Nation of Minorities" (PDF). Retrieved 2017-07-27. ↑ Krylov, Alexander (1990). "Islam and nationalism: Two trends of the separatist movement in Ethiopia". Northeast African Studies. 12 (2/3): 171–76. JSTOR 43660322. ↑ "The History of Ethiopian Jews". Jewishvirtuallibrary.org. Retrieved 16 March 2009. ↑ "Ethiopia hands lengthy prison terms to Muslim activists". DailySabah. 4 August 2015. Retrieved 24 October 2015. ↑ "Ethiopia hands lengthy prison terms to Muslim activists". Reuters. 2015-08-03. Retrieved 24 October 2015. ↑ "Ethiopia jails Muslims convicted of terror plot". BBC News. 2015-08-03. Retrieved 24 October 2015. 1 2 3 4 5 6 Shivley, K. "Addis Ababa, Ethiopia" Macalester.edu. Retrieved 15 May 2008. ↑ Belete, A. (1991). "Development of agriculture in Ethiopia since the 1975 land reform". Agricultural Economics. 6 (2): 159–75. doi:10.1016/0169-5150(91)90022-D.
↑ "Poverty in Ethiopia Down 33 Percent Since 2000" . Retrieved 2016-06-24. ↑ "Condominium housing in Ethiopia". Archived from the original on 4 January 2017. ↑ "Global distribution of health workers in WHO Member States" (PDF). The World Health Report 2006. World Health Organization. Retrieved 2 February 2008. ↑ "WaterAid UK – Where we work – Ethiopia". www.wateraid.org. Retrieved 2015-05-16. 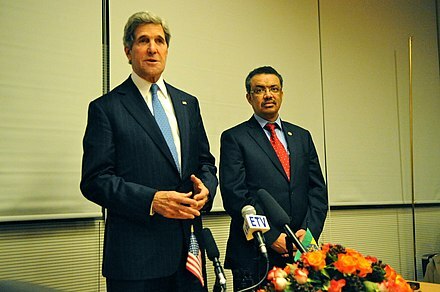 ↑ "Ethiopia – Health and Welfare". Countrystudies.us. Retrieved 16 March 2009. ↑ "Ethiopia MDG Report (2014)". UNDP in Ethiopia. Retrieved 2016-07-01. 1 2 "Ethiopia" (PDF). Archived from the original (PDF) on 24 June 2008. Retrieved 2 June 2010. ↑ "Mortality rate, infant (per 1,000 live births) | Data". data.worldbank.org. Retrieved 2016-07-01. ↑ "UNDP MDG ETHIOPIA". Archived from [file:///C:/Users/user7/Downloads/UNDP%20MDG%202014%20Final2Oct.pdf the original] Check |url= value (help)(PDF) on 12 August 2013. ↑ "MDG UNDP Ethiopia". Archived from [file:///C:/Users/user7/Downloads/UNDP%20MDG%202014%20Final2Oct.pdf the original] Check |url= value (help)(PDF) on 12 August 2013. ↑ "WHO | Female genital mutilation". who.int. ↑ Hayes, R.O. (1975). "Female genital mutilation, fertility control, women's roles, and the patrilineage in modern Sudan: A functional analysis1". American Ethnologist. 2 (4): 617–33. doi:10.1525/ae.1975.2.4.02a00030. ↑ Frayser, Suzanne G. and Whitby, Thomas J. (1995) Studies in human sexuality: a selected guide, Libraries Unlimited, p. 257 ISBN 1-56308-131-8. ↑ Ethiopian Demographic and Health Survey (Central Statistics Agency, 2005), p. 1. ↑ "Female Genital Mutilation in Ethiopia", Africa Department, gtz.de, 2007. ↑ "Male Circumcision and AIDS: The Macroeconomic Impact of a Health Crisis by Eric Werker, Amrita Ahuja, and Brian Wendell :: NEUDC 2007 Papers :: Northeast Universities Development Consortium Conference" (PDF). Center for International Development at Harvard University. Retrieved 30 December 2010. ↑ Teferra, Damtew; Altbach, Philip G. (2003). African Higher Education: An International Reference Handbook. Indiana University Press. pp. 316–25. ISBN 978-0-253-34186-0. ↑ Engel, Jakob. "Ethiopia's progress in education: A rapid and equitablension of access – Summary" (PDF). Development Progress. Overseas Development Institute. Retrieved 13 May 2015. ↑ IIEP-UNESCO (2017). "Search Result: Ethiopia's plans and policies". Planipolis. ↑ UNESCO (2015). National EFA review, 2015 (PDF). UNESCO. p. 8. ↑ "National Human Development Report 2015 Ethiopia | Human Development Reports". hdr.undp.org. Retrieved 2015-12-24. ↑ Doyle, Lawrence R. "The Borana Calendar Reinterpreted". tusker.com. Archived from the original on 29 October 2008. ↑ "The Simpsons Episode Well-Received by Ethiopians On Social Media". Tadias Magazine. 1 December 2011. ↑ "Culture of the people of Tigrai". Tigrai Online. Retrieved 3 January 2013. 1 2 Gaffey, Conor (2017-06-01). "Why has Ethiopia pulled its mobile internet access again?". Newsweek. Retrieved 2017-08-14. ↑ "Ethiopia Internet Users". Internet Live Stats. Internet Live Stats. 2016-07-01. ↑ "What is behind Ethiopia's wave of protests?". BBC News. 2016-08-22. Retrieved 2017-08-14. ↑ "Ethiopia blocks social media sites over exam leak". Al Jazeera. 2016-07-11. Retrieved 2017-08-14. ↑ Sharkov, Damien (2016-07-12). "Ethiopia has shut down social media and here's why". Newsweek. Retrieved 2017-08-14. ↑ Abdullahi, Mohamed Diriye (2001). Culture and Customs of Somalia. Greenwood Publishing Group. p. 170. ISBN 978-0-313-31333-2. Somali music, a unique kind of music that might be mistaken at first for music from nearby countries such as Ethiopia, the Sudan, or even Arabia, can be recognized by its own tunes and styles. ↑ Tekle, Amare (1994). Eritrea and Ethiopia: from conflict to cooperation. The Red Sea Press. p. 197. ISBN 978-0-932415-97-4. Djibouti, Eritrea, Ethiopia, Somalia and Sudan have significant similarities emanating not only from culture, religion, traditions, history and aspirations ... They appreciate similar foods and spices, beverages and sweets, fabrics and tapestry, lyrics and music, and jewellery and fragrances. ↑ "Ethiopian Olympic Committee". International Olympic Committee. Retrieved 3 January 2013.